While there are different versions of the update (for example, different ones for the eligible versions of the Paperwhite), I think the end result is essentially the same. It makes sense to me that, where possible, Amazon gets that standardized. It can’t be exactly the same…the Paperwhites and Voyage need a screen light adjustment, the unlit “Kindle” least expensive model doesn’t. My guess is that this menu map will be helpful for anybody who can get the update. In my Menu Maps, I go through the interface to find out where things are (there are sometimes new things, and sometimes things move), and give you some context. I’ve found some very interesting things in the past, and I’m curious as to what I’ll see here…so let’s get started! Oh, one more thing: I did do a factory reset as part of my update, so my previous choices are likely not affecting this much. Getting through the “sleep screen” seemed the same to me. I saw a Special Offer, I could have tapped on it, I swiped to unlock, and I could have a passcode required. Once inside, that’s where the changes are first quite visually apparent. There are “tiles” or sections of information. There was also a tile with “MY LIBRARY>”, and it showed me three recent titles. There was a tile for “MY READING LISTS>”. That showed me three titles from a Wish List, and noted that there were 99+ more. A third title showed me “BOOKS FROM GOODREADS FRIENDS>”, but I know that rotates. Believe that was an ad (I have one of the more popular ad-supported versions). This one showed me ALL | DOWNLOADED (so I could choose), ALL ITEMS (3,229) with a dropdown (I’ll cover that display option shortly), and a sort choice which defaulted to RECENT. Below that, by default, I saw the covers of recent books….and I was on page 1 of 539. Grid View or List View | All Items, Books, Periodicals, Docs, Active Content, Collections. Huh…tapping on Active Content actually did show me choices. The Paperwhites haven’t worked with the Active Content. However, tapping on one just gave me an error message showing me that “This item is not compatible with this device”. In the past, I think incompatible items haven’t shown on the device. Does this suggest greater control of Cloud content from the devices? At the bottom of the screen had the page flip feature, which lets you flip ahead or back without losing your place. I also liked that it showed me the title of the story in this case (chapter title, I would guess), author, location, time left in chapter, and percentage). It looks nicer. Access to some choices is easier. There is a lot of emphasis on discovery of books to read…people may see that as ads for things for you to buy, and much of it is…but I appreciate having Kindle Unlimited recommendations, which cost me nothing more. What do you think? Do you have other questions? Have you found other things? Feel free to share with me and my readers by commenting on this post. Let’s get a couple of things out of the way. Is this, by far the least expensive backlit table Amazon has done, worth the $50? Can you tell they’ve cut a few corners? Let’s start out with something which won’t affect your use of it, but was…different. It was more like…a semi-rigid lunch bag. Yep, and that came in a padded envelope: I assume that saved them some money. It does just about everything…apps, games, videos, e-books, Prime Music, audiobooks, web surfing. The screen is a bit less clear than my other Fires, but acceptable for me. The sounds isn’t as good…but again, acceptable. I’d say it’s reasonably comfortable to hold. I do have a cover coming…I’ll like it better with that. This might be a matter of slight individual variation, but the screen isn’t quite flush with the case…the case is a little taller. That’s not the case with my (now discontinued) Kindle Fire HDX. The thing that makes it look the cheapest, I’d say, is that the power button and the volume rocker are both silver colored…like they haven’t been “painted”, unlike my other Fires. Outside of that, it’s pretty sleek looking. As to the interface…I like it! This is the new Fire OS 5 (which will come to some older models…my guess is Fire tablets at OS 4, which goes back to the 3rd generation). It feels a lot more like an Android phone. You swipe up to unlock it. You “long press” an icon to put it on top of another icon to start a folder. You have a back button. I think people used to using any SmartPhone will be able to pick it up and start using it pretty easily. Okay, let’s start working through this. In this post, I’ll do menus outside of specific content (I won’t go into the menus or interface inside a book in this post, for example…this one will be long enough without that). 😉 I’ll follow up with a part 2 before too long. On the top edge of the device, there are those physical buttons: the power button and the volume rocker. For some reason, I keep hitting the volume when I want to hit the power…it’s not because it’s like my other models, because they don’t have the volume and the power on the same edge. That won’t matter once my “autosleep” cover is here. I’ll tell you which one I got after I try it out. 🙂 Also on the top edge: the headphone jack and the power/micro-USB. On one edge is the micro-SD card slot: wow, the cover seems like it would be easy to break off. We’ll see…it swings out, by the way. Once I unlock the device, I’m at the homescreen. Below that is a searchbox. Tap it to bring up the keyboard. Note that this (I think only this model) does not have dictation…there is no microphone icon to enable you to speak your request. It also doesn’t allow “trace typing”, like the Swype keyboard. I’d miss both of those, for sure, if this was my only tablet. I use the Swype style a lot on my Kindle Fire HDX…and the dictation. Once you’ve typed it in, you can hit a yellowish magnifying glass button to search. You get Web results, Amazon, and “My Stuff”. I like the look of this! Seems like good functionality, although I would prefer it to default to My Stuff. There might be an economic reason for that…Amazon might be getting something from Microsoft (Bing was my default browser, but I think I can change that) for its results displaying first. On the My Stuff tab, there is an additional link at the bottom to “Search emails, calendar, contacts and more”. It’s worth noting now something that might throw someone used to earlier Amazon devices: at the bottom of the screen, we have three icons. One is a left pointing pyramid, which means back…that’s deducible. The middle icon is a circle: that’s the new icon for Home (it used to look like a stylized house). Perhaps not coincidentally, that’s reminiscent of the Home physical button on an iPhone. There is also a square…that’s for recent items, the equivalent of the Carousel. On the apps tab, I’m only seeing The Washington Post…not the Fire apps that came on it. I can open that app, or use the menu (three dots), which lets me delete it from the device, delete it from the Cloud (I wouldn’t recommend that…you surrender your license, meaning that anyone who is now or may be on your account in the future who wants to use it in the future will have to pay for it again…if it’s even available), and Share. Note that this is not sharing the functionality of the app…just a link to it. On the APPS tab, I also have a link to the Appstore (it looks like a shopping cart), a menu (three horizontal lines) which lets me sort by Title or “Recency) and Filter Apps (this has an option to “Show Apps on External Storage”), and a search. Swiping down from the top, I get that Quick Access panel. Swiping left to right, I see my Recent. Swiping right to left, I move to the next item on the content ribbon, which is BOOKS. Let’s talk about that Quick Access panel. Tapping brightness seems obvious…I don’t see an option for autobrightness here, which I think is not available on this model. Remember that how bright your screen is really affects how quickly your battery drains. Wi-fi icon (with the name of the network): tapping that takes me to wi-fi settings). Airplane Mode: tapping that puts your Fire into “island mode”…nothing that connects to anything else, including wi-fi and Bluetooth. Bluetooth: turns this short range wireless connection on and off. Bluetooth will also run down your battery charge, although I think having your Fire set on the brightest possibility may be worse. Do Not Disturb cuts off notifications. Help…this has been redesigned, and deserves a mention. Holy moley, that was a lot of choices! There are some really significant improvements. I stopped what I was doing to explain the wi-fi password storage to my Significant Other: that doesn’t happen often! I said Amazon would have a hit with this device…they have already commented on how successful it has been so far! I’ll do another post (probably not next) on controls within content. In the meantime, if you have any questions, or comments, feel free to let me and my readers know by commenting on this post. Update: two of my readers had excellent points! You can also buy longer terms for more money. Elaine Jordan asked a terrific question, and the answer does…disappoint me a bit. I should have noticed when I was listing the Display menu settings but this model, and only this model in the current generation, does not mirror to a capable TV or other device. Certainly, that saved some money. I probably mirror to my TV a couple of times a week on average. It’s not a lot, but when I do use it, it’s a important. Mirroring means that whatever is on my device shows on the TV live. For example, I might be streaming video from another site, like http://www.archive.org. Alternatively, I might be on a website and want to share it with my Significant Other (this is just an example…I don’t do that a lot). I would guess not, for most people. That one is also a smaller screen, and many people (including me) could mirror from a SmartPhone instead. Let me first say that it was particularly easy to set up. They’ve been improving that, with on-screen guidance. All I needed was my wi-fi network password, and the rest of it was easy. They even gave me a choice to set up parental controls, although I skipped that. I’d say it took less than a minute to get itself up and running the first time. It knew its name (“PowPow”), and it showed me the device time so I could confirm that it got it right (it did). I had my Cloud/archives, and was ready to go. It did still have to index the (wait for it)…Kindle User’s Guide! Yes, it came with an onboard User’s Guide, not just online, which was nice. 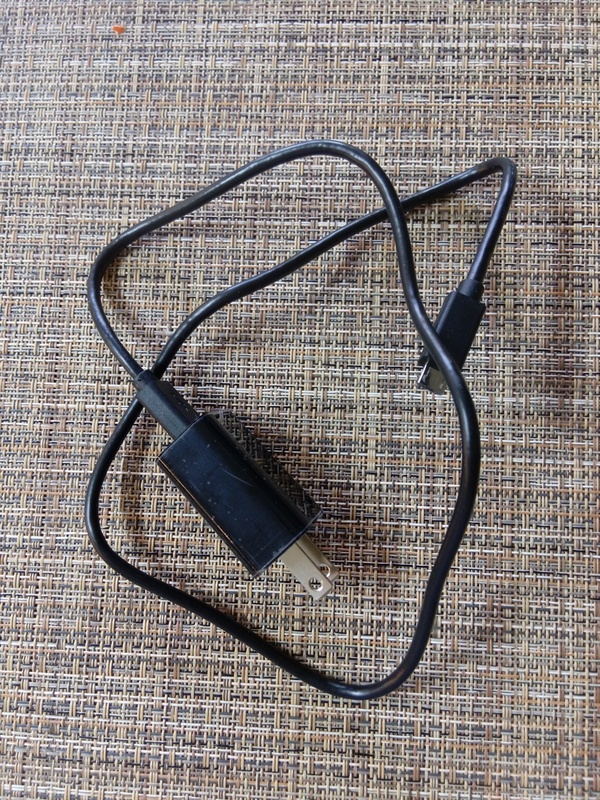 It came about half-charged: people do ask about that sometimes. The screen is quite evenly lit: you don’t have those “smudgy” spots on the bottom that you had with the Kindle Paperwhite 1. 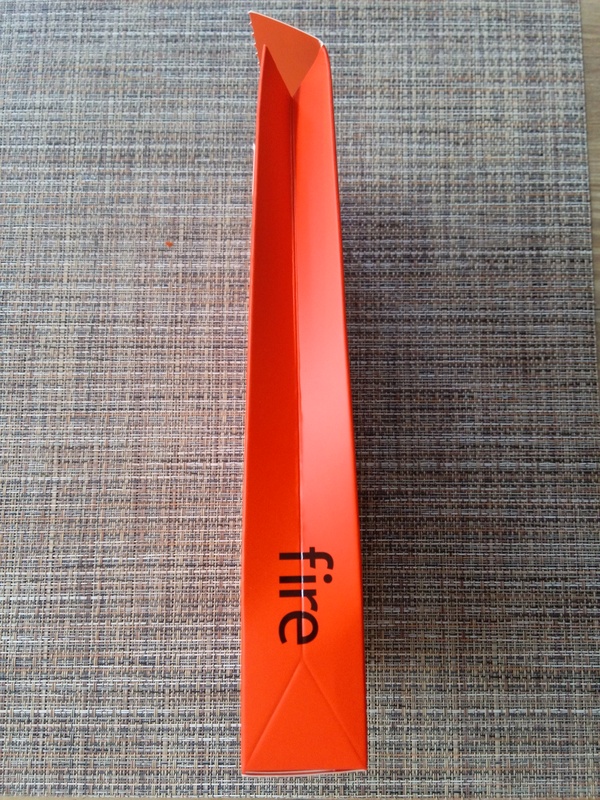 I like the raised “Amazon” on the back of the device…it gives it a bit of tactility. It does seem brighter and clearer. Even at the lowest lighting setting, there was still a bit of light, but it was quite, quite dim…even with my superior night vision, I would have been challenged to read at that setting in full darkness. Displayed along the top was my name for the device, wi-fi and the strength, the battery indicator, and the clock. At the bottom of the device, it told me what page of items I was on, and how many pages there were all together…and there was an ad, less than an inch tall. I’d say it isn’t a hard adjustment at all from the PW1. Within a book, you tap towards the top middle to bring up the toolbar…oh, and it displays the name of the book on the top line, where the name of the device normally is. Not intuitive to me was that at the bottom of the screen, there was a things which told me the chapter I was in, what location I was on, and how many minutes were left to read in the chapter. Tapping it brought up the new Page Flip feature, which is really cool. You can preview pages, moving ahead or backwards with arrows, without losing your place. There is also a location slider, to adjust where you are in the book. The location slider also had a “chevron walks into a bar” icons (>|) which lets you jump by chapters…but just in Page Flip. It looks to me like you could figure out where you want to go with Page Flip, and then use the Go To button to get there. “Long-pressing” (holding your finger or stylus on it for about a second) a word in a book gave me an X-Ray definition first, and a choice to get “More on Shelfari”. Tapping that brought me to the Shelfari (owned by Amazon) page for the current book…lots of info there). I could also open the full X-Ray for that book. I had a choice to see the Dictionary definition, or Wikipedia. I tried the Wikipedia search with Airplane Mode on…it didn’t like that much. I could also search This Book, All Text, or the Kindle Store. If you have any specific questions, or comments, feel free to let me and my readers know by commenting on this post. This time, I’m going to run through the menus on the home screen on a Kindle Paperwhite 3G + wi-fi (with Special Offers). This is based on firmware version 5.3.4. You “wake” a Paperwhite by first hitting the power button (or by opening an “autowake” cover…something I find very convenient, especially with the new power buttons on Kindles which can be hard to locate), and then swiping (holding your fingertip or stylus on the screen and sliding it a couple of inches) it. Hm…I’ve got enough room here. I’ll go through the basic menu in a book. Tap towards the top middle of the book to get the menu to appear. It’s a nice table! It’s interesting to me that Japan, for example, doesn’t have Popular Highlights or Public Notes…is that technical, societal, or due to regulations? They list “Sina Weibo” on the table under Social Media and Device Features…but don’t show that any current device has it! That’s a Chinese microblogging website…this seems like a clear indicator of more Amazon/Kindle involvement in China in the future. That might be a bit of a scoop here. 🙂 I did a Google search, and while there were matches for “Kindle Sina Weibo”, I don’t think it was about this as a legitimate future feature. If you have questions or comments, feel free to comment on this post. This time, I’m going to run through the menus on the home screen (there are just too many to do in one post if I start on in-book menus and such…perhaps another time) on a Kindle Fire HD 8.9″ 4G LTE Wireless 32GB (with Special Offers). This is based on firmware version 8.3.0. This is a recent update, and I do think some things have changed. I think the menus here will be similar to those for an 8.9″ without 4G (except for the ones related to that), and likely similar for other Kindle Fire HDs. You reach this by swiping down from the top. 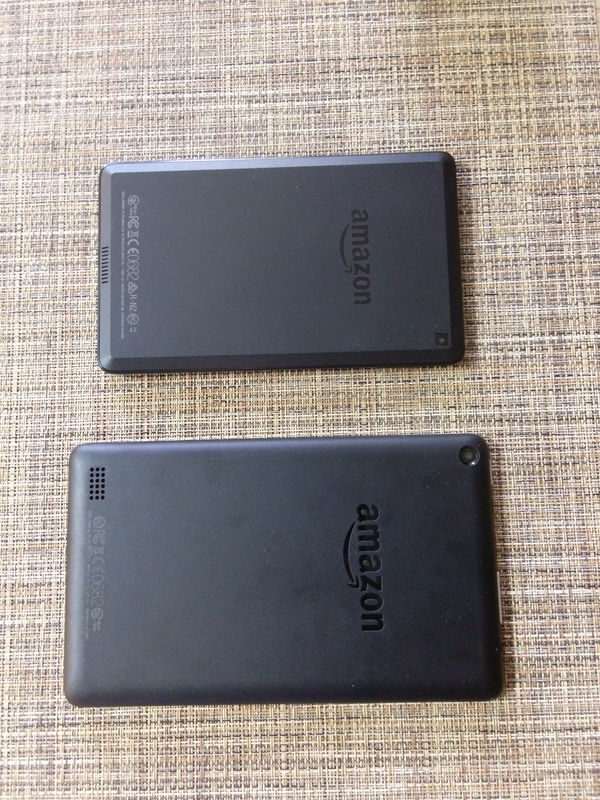 I’ve done this kind of thing for the Kindle Fire in my book, Love Your Kindle Fire: The ILMK Guide to Amazon’s Entertablet, and I’ve done it in this blog before for other models. I think this may become a regular feature, but do let me know if you find it helpful (or not). I’m going to run through the menus on a Kindle Touch (specifically, a wi-fi only Kindle Touch with Special Offers in the USA). This is based on firmware version 5.1.0. With the Touch, you would first wake it up or turn it on with the power button on the bottom (press and release). Those four horizontal lines below the screen are the “Home” button. I’ve heard people asking if that was a speaker or a vent. I personally would have made it look like a little house, because four horizontal lines typically means a menu, rather than Home. The Menu button is in your top right corner of the screen. Tap that. Here’s the key thing, and something that might surprise you. You can hit Menu again to see another menu. You got here through a menu, but that doesn’t mean you can’t use Menu to get even deeper. To access the Menu from within a book, you first tap towards the top of the screen, in the middle horizontally, then tap Menu. Those aren’t the only menus: you’ll have a different menu in different types of content. For example, a magazine will have a menu option to “Keep This Issue”, which keeps a copy of that specific issue locally on that device. If you don’t do that, you’ll eventually lose that issue as new ones come it. That kept issue is not saved for you on Amazon’s servers…just that local copy which is keyed to work only on that specific device.